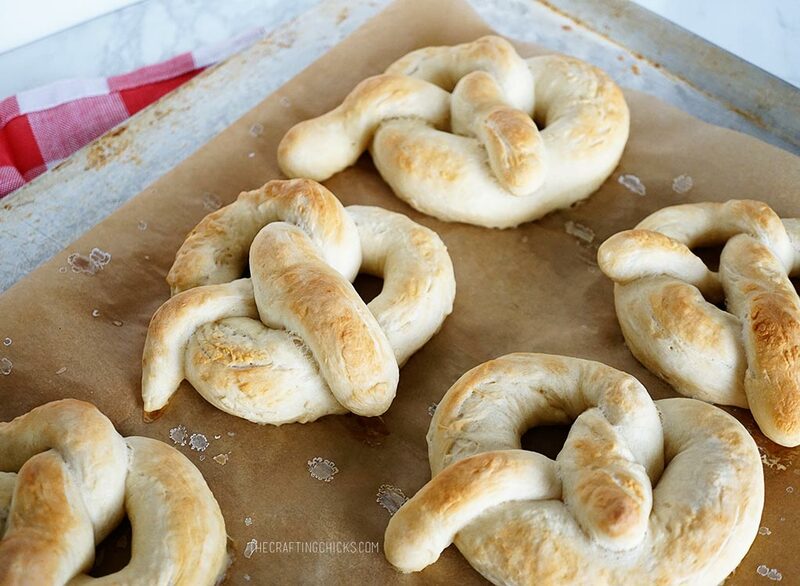 You don’t need a trip to the mall to enjoy a chewy soft pretzel at home! 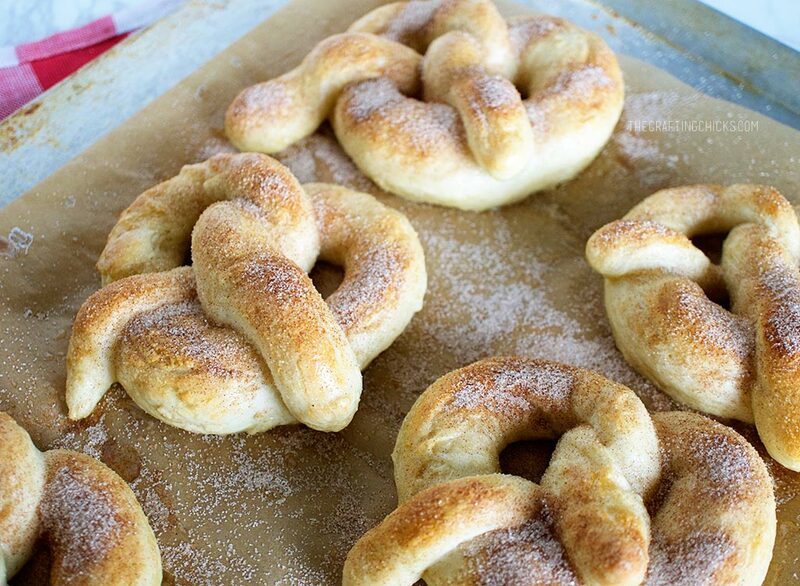 This soft pretzel recipe doesn’t even require boiling to get the right texture. Ah, soft pretzels! They take me straight back to junior high at the mall with Orange Julius’s. I love them today as much as I did back then. The only difference is now I make them at home. And they are sooo good! 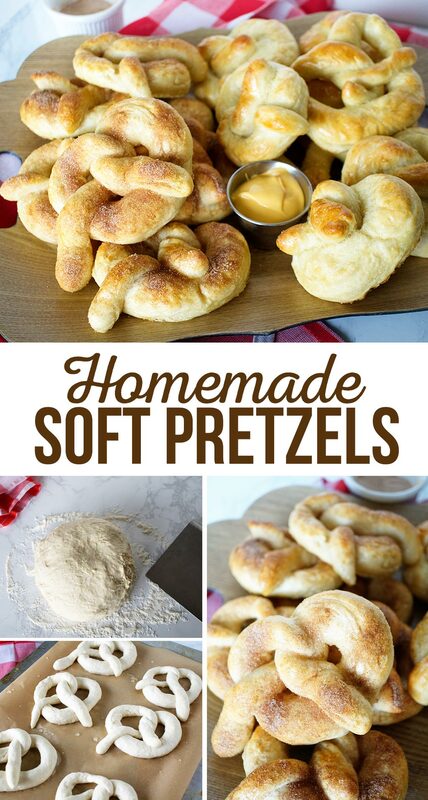 One time I was feeling lazy and picked up some frozen pretzels and my kids wouldn’t even eat them – these are so much better than the frozen ones. 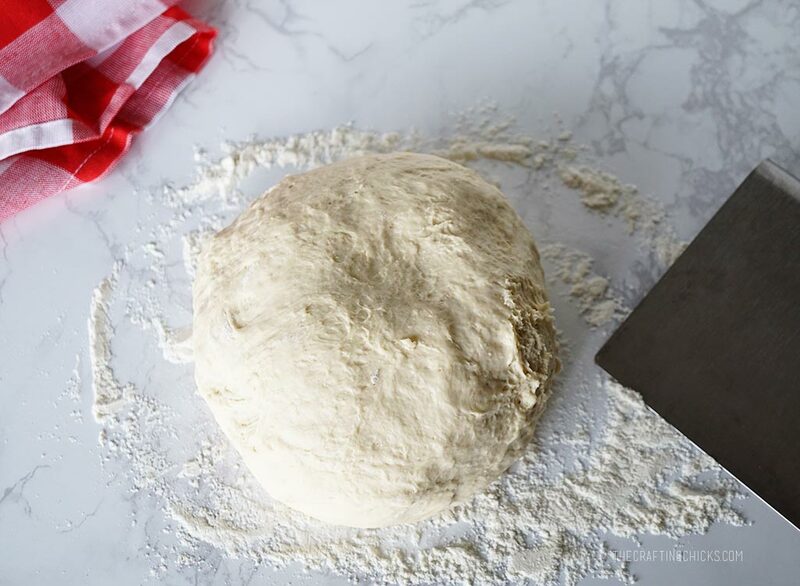 This is a great dough recipe for beginning bread makers and the one I turn to time after time for a group of kids to help with. My activity day girls loved making their own pretzels! It is great because it makes 12, and they can all roll out and form their own pretzels. Start by mixing up the dough and letting it raise for 1 hour. Then cut the dough into 12 sections. I like to use my dough scraper to do the cutting. It is great for slicing through bread dough, as well as cleaning up when I’m done and I only have one tool to wash at the end. This is the point that kids can get involved. 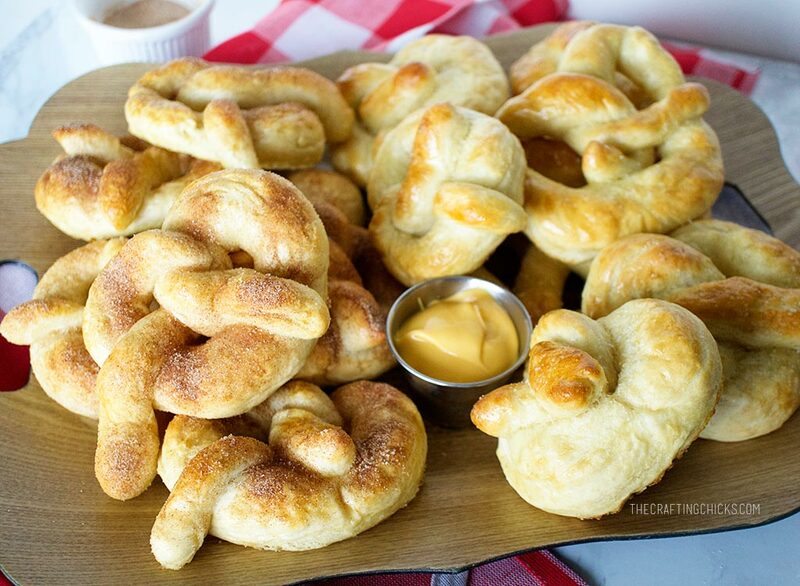 Give each a ball of dough and let them make their own pretzel. It’s as easy as making a snake out of play dough. 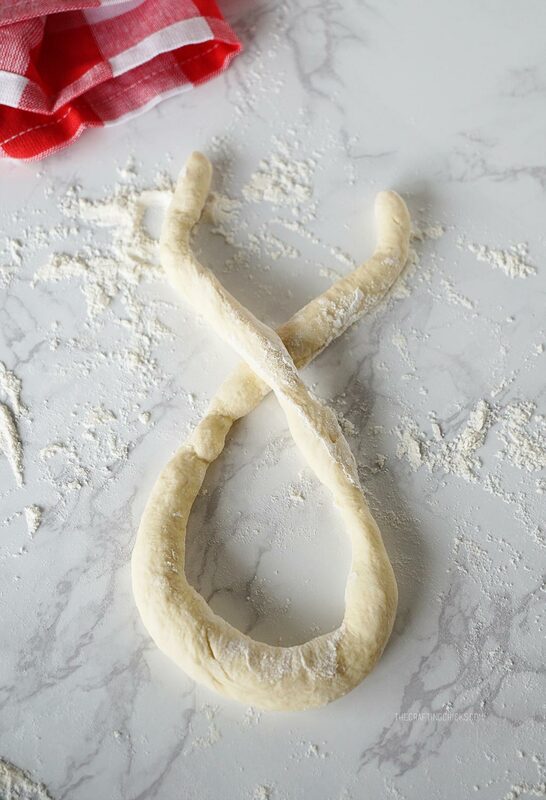 Roll the pieces of dough into 18″ snakes. To form the pretzel shape first loop the snake like this, crossing the end pieces. 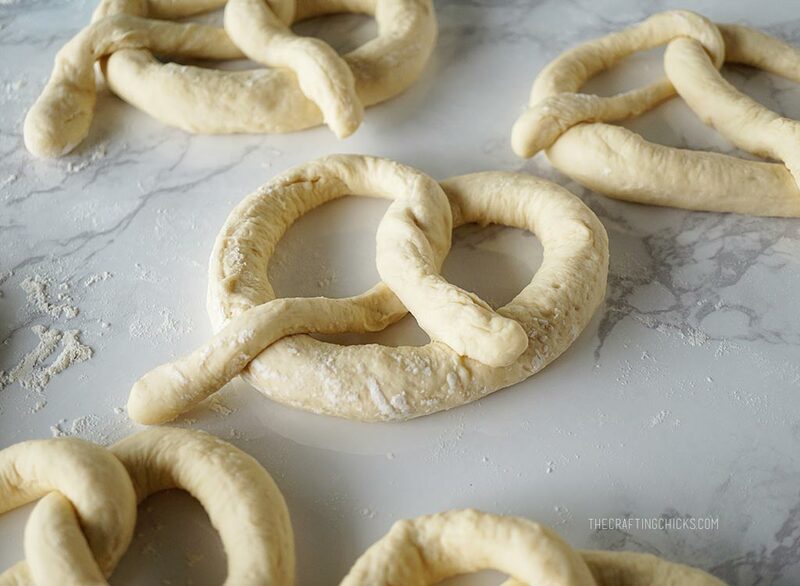 Then bring the ends down, and twist one more time before laying the ends over the curve, making a pretzel shape. 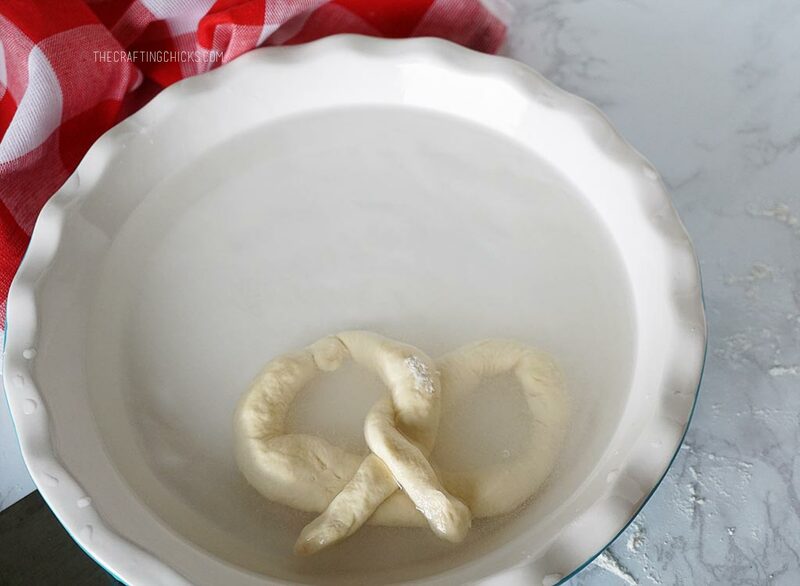 Make a simple mixture with warm water and baking soda to quickly dip the pretzels in. This step replaces the traditional boiling and I don’t know how it works, I just know that it does. 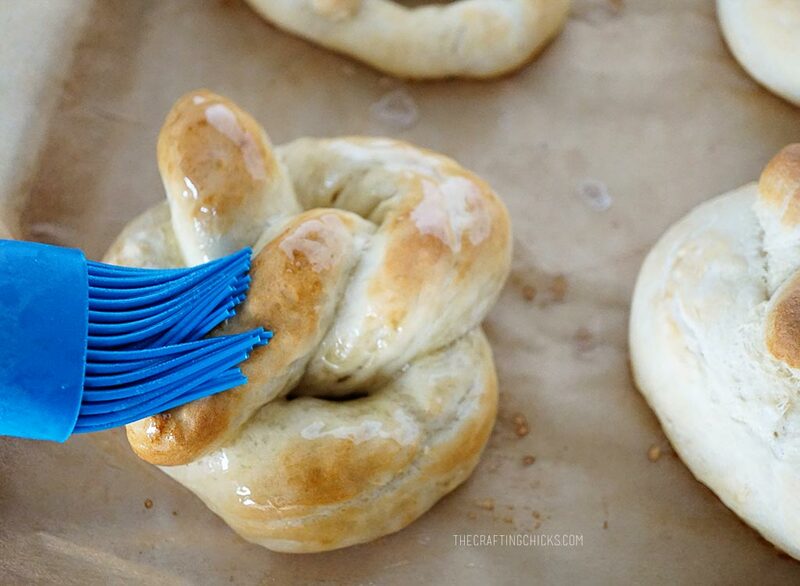 Quickly dip each pretzel into the soda water and then place on a baking sheet lined with parchment. If you are working with a group you can let them write their name next to their pretzel on the parchment. 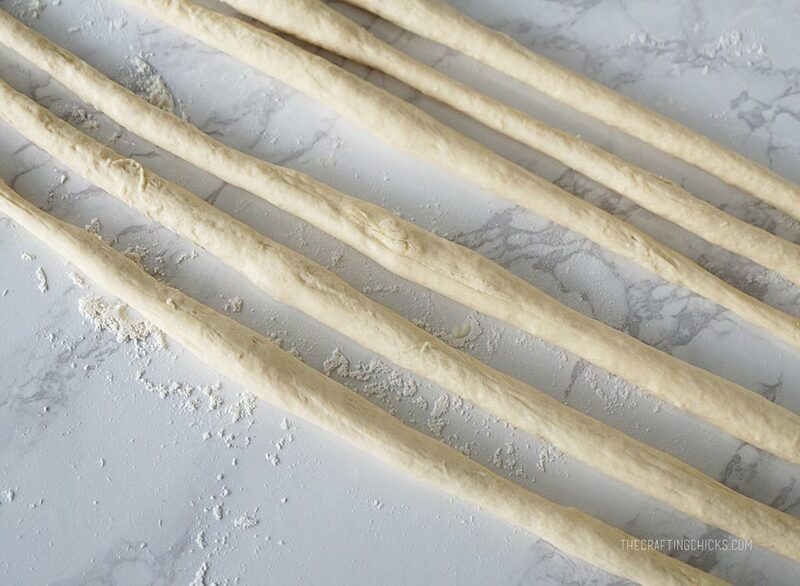 Let the pretzels raise for another 20 minutes before baking. Bake at 450 degrees for 8 minutes. Once they come out of the oven, brush with butter and sprinkle with pretzel salt or my kids favorite, cinnamon and sugar. I bake 6 pretzels per sheet so we usually end up with one pan of salted pretzels and one pan of cinnamon and sugar. Mix yeast, brown sugar, salt, 1½ c warm water and the flour together. 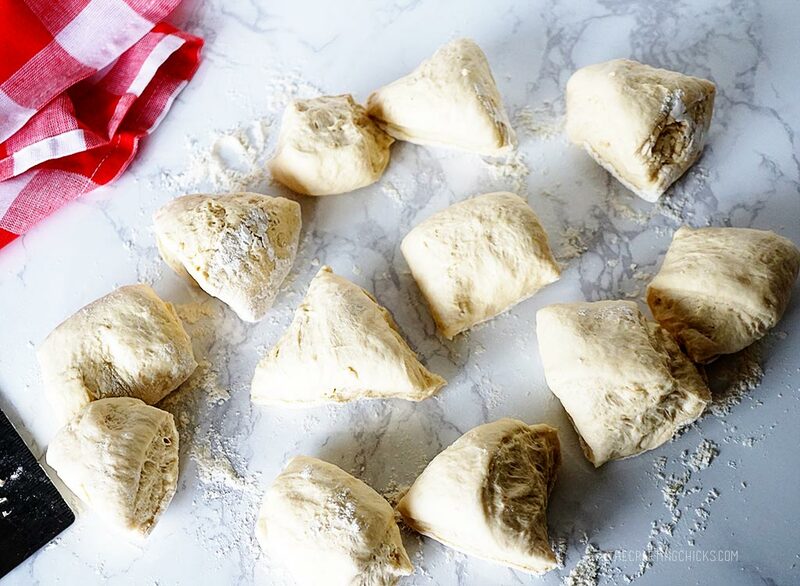 Add flour until the dough forms a ball and begins to pull away from the sides. Mix together and knead for 3 minutes. Cover and let raise for 1 hour. 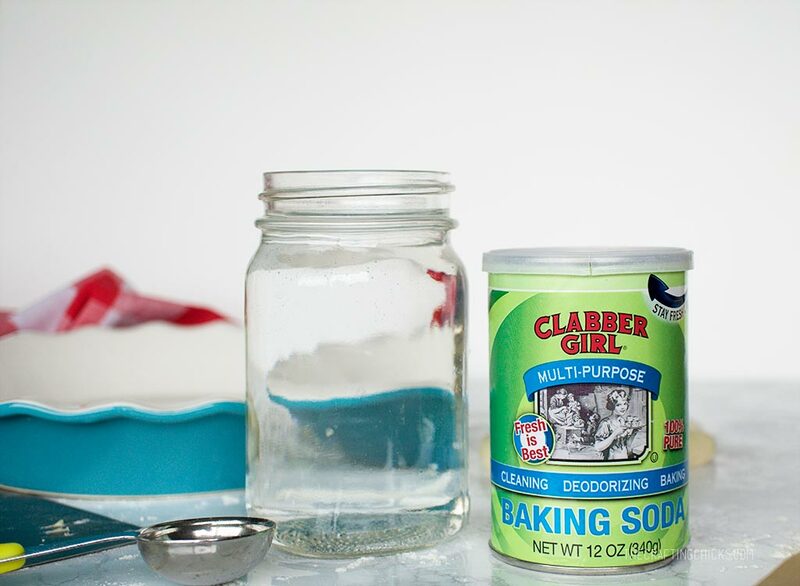 Mix 2 cups warm water with 2 Tbsp baking soda. 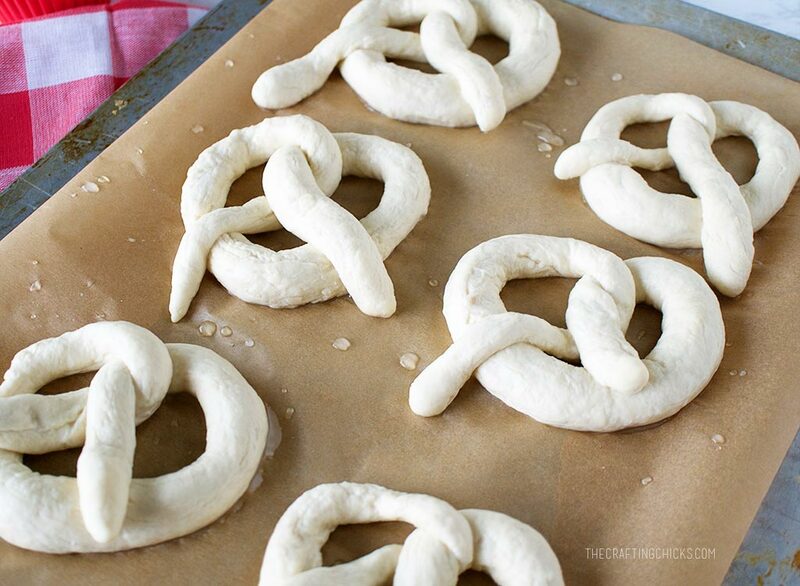 Dip pretzels in baking soda mixture. Let raise 15-20 minutes. Bake at 450 for 8 minutes. Serve them with your favorite dipping sauce, mustard, cheese, cream cheese frosting, etc. or just eat them plain. 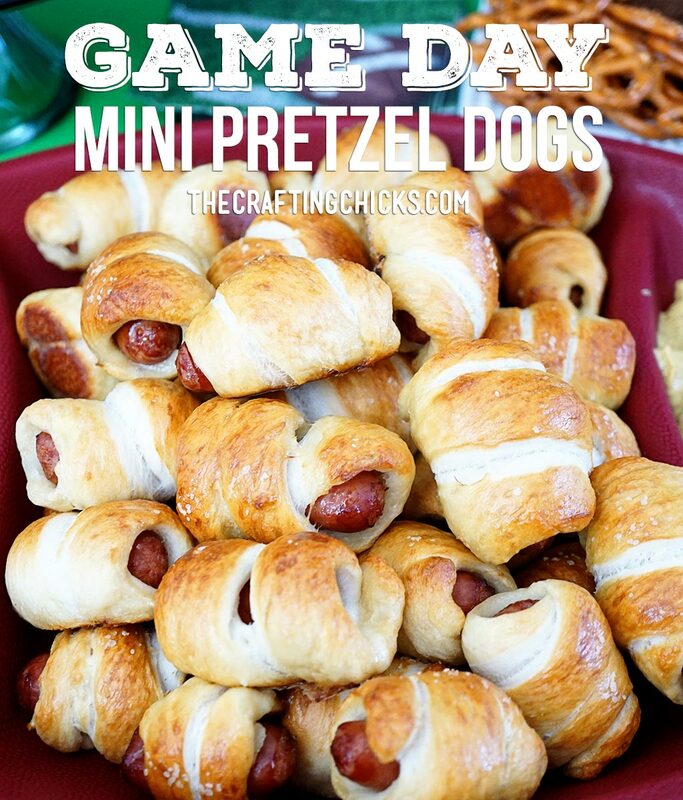 Another delicious pretzel recipe is our Mini Pretzel Dogs.